This oil on canvas painting was sold to me in the early 1980s by a trusted local importer-dealer who purchased it from a dealer in London. 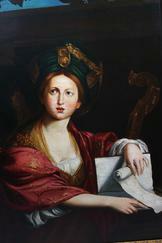 The London dealer had reportedly purchased it from a dealer in Italy as a middle-late 19th century Italian workshop piece, a copy of the early 17th Century Cumean Sybil or St. Cecelia in the Bolognese style by Domenichino. This evaluation appears to be corrrect in that the canvas itself is machine made which places it after 1840, and the brushwork and technique are consistent with the Italian Baroque style. However, upon further investigation it appears that the painting has been lined, which may make the painting earlier. There are markings on the surface consistent with 18th and early 19th century paintings that have undergone the lining process. This local dealer is still a close friend but cannot remember any more about where he obtained it or any details about it. On a trip to Charleston, South Carolina I encountered a copy of this work in an exhibition on the Grand Tour entitled "In Pursuit of Refinement: Charlstonians abroad, 1740-1860". The painting was called out as one of 17 contemporary copies of the "Cumean Sybil" by Bolognese artist Domenico Zamperini, more commonly known as Domenichino (1581-1641). The actual Domenichino is seen to the right. The painting in the Gibbes Museum of Art is from the collection of the Middleton Place plantation and is surmised to have been obtained by the family in the late 18th or early 19th century. Interestingly enough, my paining is more finely done than the one from Middleton. 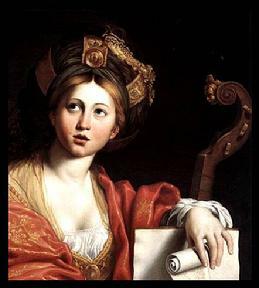 While the Domenichino has always been identified as the "Cumean Sybil" the subject has the attributes of St. Cecilia, the Patron Saint of musicians and Church music. The viola di gamba and sheet music are indicative of the artist portraying the subject as the saint. 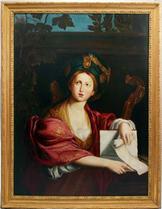 Domenichino himself painted a "St. Cecilia" that today hangs in the Louvre. A cursory inspection reveals a more than passing resemblance between the "Sybil" and "Cecilia"
Below are pictures of the painting I have. They are accurate except that the colors are more vibrant than depicted in the photos. It is fairly evident that my painting is a workshop piece. The figure and clothing are very detailed and precise while the neck and head of the viola and the background are less detailed. This painting would benefit from a professional cleaning. There is some detail in the background that is difficult to make out. It is a lovely painting that I have enjoyed for over 30 years. This painting is for sale. Serious offers should be sent to Richard@CocoanutandPalm.com. Any additional information would be greatly appreciated and is eagerly sought.